Cook spaghetti according to package directions. Meanwhile, in a large skillet, cook beef and onion over medium heat until meat is no longer pink; drain. Stir in spaghetti sauce and seasoned salt; set aside. 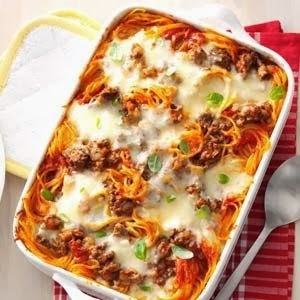 Place half of the spaghetti mixture in a greased 3-qt, baking dish. Top with half of the cottage cheese, meat sauce and mozzarella cheese. Repeat layers. Cover and bake at 350° for 40 minutes. Uncover; bake 20-25 minutes longer or until cheese is melted.